A search through Google Books section of public domain books yields a treasure trove of needlework techniques to use in embellishing a plain garment for an antique doll. 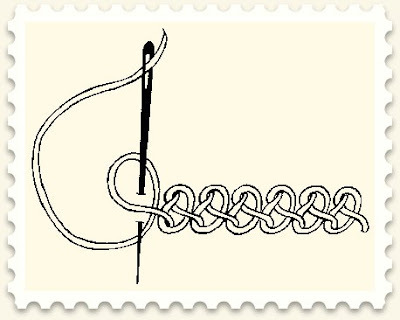 Trims and braids can be approximated with some embroidery techniques, such as the braid stitch above. Here are a few books I found with some interesting instruction and graphics. It's best to click on the "contents" at the top of the page and you can browse the book. You can also download them in PDF format for future reference. 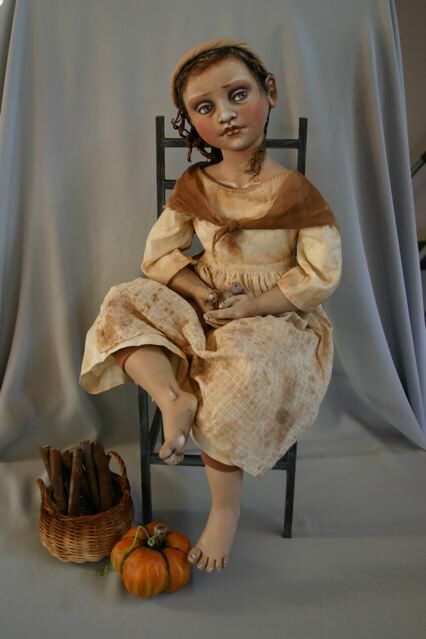 with doll artists featured here on MAIDA Today. Susie is one of my favorite people and artists! I've been making dolls for as long as I can remember - as I child I was always making things with whatever I could lay my hands on. Mostly I made little people - dolls - and I remember being always encouraged to have busy hands. I had that rare thing in the 1950's - a mother who actually encouraged creative mess! Even at Art School when I was studying Serious Art (note capitals) I made dolls and had "doll ideas". When I was newly graduated, a young mother and exhibiting paintings with a group I was showing dolls. Back then in 1973, they were just dolls: now I realize they were probably something more than that. Anyway, they sold well! I've always been something of an experimenter - something that was driven by necessity. Tasmania, where I have spent my entire life, has a very small population so things used to be hard to source. I got used to doing pretty much everything for myself. Now with the Internet, it is much easier to share the interest, the knowledge and to source "stuff". The upshot is, that I have tried every conceivable material that could be used for making a doll. Lots of experimentation, lots of failure. lots of learning by doing. I had my first doll sales in 1964 when I was twelve - I had an order to make a number of large, floppy clown dolls after someone had seen the ones I'd made for my younger brothers and sister. The nineteen shillings and sixpence I got for each one made me feel rich indeed. And being paid for something I love to do. Life doesn't get much better than that at age twelve! The creative process I go through when planning a new piece depends on what the piece is - if it is simply a doll in the style of a play doll, I just start making it. But if it is an art doll, it usually requires a bit more planning - at least a sketch and a number of working drawings to plan construction etc. I have quite a collection of sketchbooks dating from Art School to the present that make quite an interesting record of how my creative thought processes have changed and developed. These days, having worked at my craft for so long, I can usually have a piece end up looking pretty much how I conceived it - this wasn't always the case - I used to get very frustrated by the inability to realize a concept how I saw it in my mind. Usually what blocked it was lack of skill in some area. A lifetime of working at it means that I now have the necessary skills to make what I see in my head. What is your favorite doll that you've made? It's hard to pick a favourite doll that I've made - for me the actual making process is what is important. Once the doll is made and I am happy with it, I've moved on to something else and I usually have no particular attachment to it. Having said that, I liked this piece that I made last winter. It was on a much larger scale than I usually work, so I was able to really get some expressive nuances into the face, which pleased me. Of course my work has changed and evolved. I mean it's been a long journey! If I felt I wasn't evolving as a doll maker, I think I would rapidly lose interest. Doll making is fascinating because there is always some new path to go down; some unopened door with hidden treasures behind it. Some years ago, my husband built me a studio.........well it's for both of us really. He's a writer and photographer so he uses one end and I have the other. It's large, so we don't get in each other's way, except that I like to work to music and he doesn't and I like to have the fire cranked up in winter (the woodstove is in my end). The space is large enough to have classes of up to about ten people. It's light and airy and a pleasure to be in. I also like the fact that it is separate from the house, so I have to leave the house and 'go to work' each morning. So much better that the dining table, which was my previous work space. Were you a doll person as a child? Do you remember making any dolls as a child? What was your favorite doll as a child? What were your other play interests as a child? I must have been a 'doll person' as a child - every picture that exists of me (there are not many - I was meant to be a boy after the birth of my older sister) has me with a doll of some kind tucked under my arm. I was always making them and their habitats (see no 1 above). As I child I was given a special doll by a friend of the family - it had been in his family for many years. It had a papier mache head and limbs and a cloth body. I called the doll "Lonny doll" and I lost her in the bush over the back fence where we used to play. I must have been about five and I felt that loss intensely. Sometimes I wonder whether all this doll making I do is somehow an attempt to assuage the dreadful feeling of loss when Lonny doll could not be found. As a child (pre TV in Tasmania) I used to play lots of imaginitve games with my siblings and with friends. And I was always drawing or making something. I loved school and did well academically. I have a couple of vintage dolls - no antiques. They were given to me. I have bought some dolls made by artists. 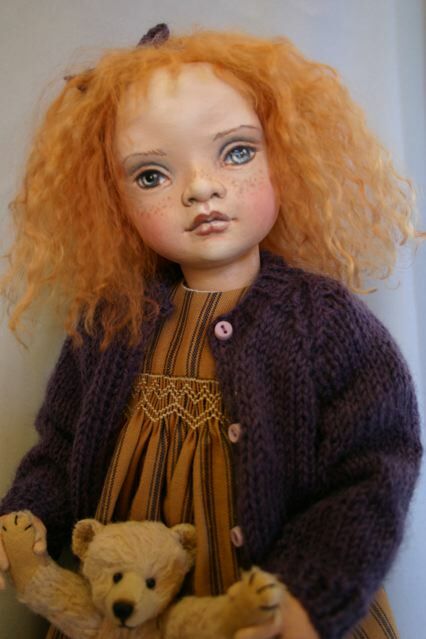 I have one by Susan Fosnot, one by Maggie Iacono and an Annette Himstead doll. My work is my life's passion, but apart from creating dolls, patterns and related stuff, I play music, I like to garden and I read a lot. I also paint, sew, knit, embroider etc, etc. And I love to cook. What keeps you engaged in the creative process? I think I stay engaged in the doll creating process because there is always some new challenge. One aspect of doll-making that I find particularly engaging is the fact that you get to dabble in a whole lot of different things in the process of making a single doll - it's never boring! There is a whole lot of stuff swimming around in my brain - like a big soup. It results from everything I've experienced - seen, heard, read etc. This Inspiration Soup just sloshes around and occasionally an idea pops out and demands to be made. Inspirational dollmakers............Kaethe Kruse, Izannah Walker, Marion Kaulitz - all in dollmakers heaven. Living dollmakers who inspire? Lisa Lichtenfels, Jo-Ellen Trilling, Scott Radke. There are others, but these come immediately to mind. What are your favorite types of antique dolls? Among antique dolls I am most drawn to anything made in cloth. I haven't seen too many of them in real life, but even in pictures they are instantly appealing.............much more appealing to me than a French bebe in bisque with big glass eyes and all the frills and furbelows, for example. Don't know where this comes from, but it is a great quote: "Hardening of the categories leads to art disease." Given ideal circumstances, how many hours a day would you like to be able to devote to your doll-making? My answer: Probably at least ten. I dislike how everyday things tend to eat into my creativity time. I need a maid! Visit Susie's blog to see more of her work. Edyth and Helen Pringle have been friends for many years. 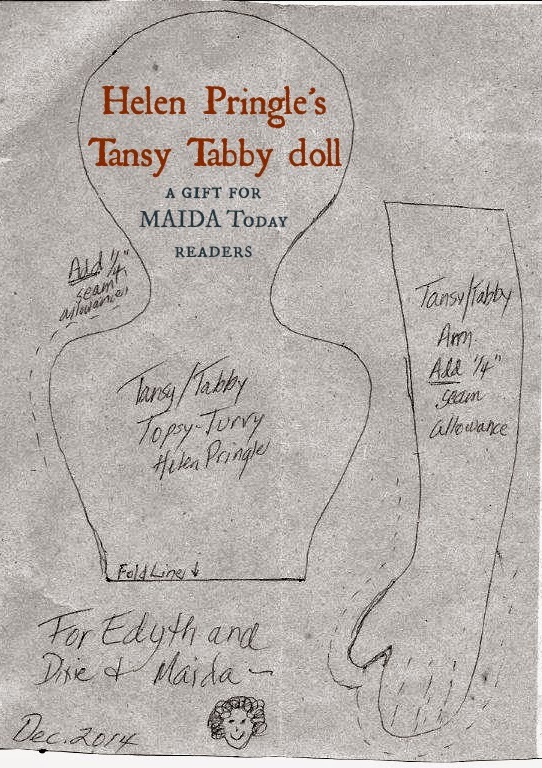 Helen P. shared instructions and images for making a topsy doll she calls Tansy-Tabby with Edyth to share here with MAIDA readers. 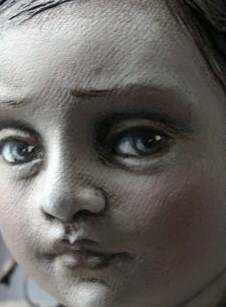 I made up this doll to use in classes teaching oil-painted cloth dolls. Most makers chose the traditional one black girl and one white girl, but they could both be the same skin tone, one young/one older, or any variation. Since there has to be a skirt to cover Tabby when Tansy is up, I never could think of a way to do girl/boy. (Kilt, maybe?) Both faces can be on the same side of the doll, or one face each way. Since oils take a long time to dry, I usually had them face the same way so T/T could lie down while drying, and I like to see both faces at once. She could, of course, dry in a doll stand. Needles, pins, thread, doll stuffing, Liquitex Light Modeling Paste, paints, brushes, sewing machine, scissors, tape measure, fabric glue, iron and board, a good light, etc., etc. This pattern has only two pieces, the head/body piece, and the arm. The body pattern has a head on each end, and they share a waistline. Their arms are separate and will be sewn on to the shoulders so that when Tansy is in view and Tabby is covered by the skirt, her arms will fall naturally (thumbs forward), and vice-versa. 1. Cut two head/body pieces from calico or documentary print, adding ¼” seam allowance if not shown. 2. Cut four arm pieces from the same fabric. 3. Right sides together, sew the body pieces together, leaving a small opening on one side seam for stuffing. Stuff firmly and whip the opening closed. 4. Right sides together, sew arm pieces together, leaving top open for stuffing. 5. Stuff each hand lightly, then sew lines separating the fingers. Stuff the rest of the arm not too firm, stopping about an inch from the top. It is simpler to paint while the arms are not attached, so lay them aside until coating. 6. Using the top of the head seam line as your boundary, paint a light coat of Liquitex Light Modeling Paste on the front of each girl’s head, neck and shoulders, and the back of the neck and shoulders, leaving the back of the head in the calico, which will be the back of her cap. (Do not use gesso as the undercoat, as it will crack and mar the paint. The LLMP will provide a base for the paint and will remain flexible if pressed.) You may use more than one coat if you like. It dries fast, so work quickly. 7. Paint all four hands, curving the fingers into a natural shape before the undercoat dries. Let dry several hours or overnight. 8. Paint each girl’s face and hair, shoulders and hands on the undercoated surfaces. If painting with acrylics, let dry several hours. If using oils, let dry several days, until thoroughly dry to the touch. You can use oils over acrylics, but NOT vice-versa. I sometimes painted a coat of acrylic paint in the proper skin tone over the basecoat before painting the features and hair with oils. Because you have to hold the doll(s) to paint them, if using oils it may be good to paint one head and let it dry before painting the second one. 9. Using small lace or trim, cover the paint lines on wrists, necklines, and around the top of the head and the neck in back to outline the “bonnet.” Carefully glue the trim in place, turning under the raw edge at the end. A. square 24” x 24” for the skirt. Cut with one edge on selvedge, if possible. B. A rectangle for waistband: Width, 2-1/2” x Length, dolls’ waist measurement, plus 2”. C. Right sides together, sew the skirt long edges (selvedge) together and press seam open. You now have a 12” x 24” tube. Turn right side out, fold raw edges together and you now have a 12” x 12” tube with two right sides (so both skirts are right side out and there is no hem). D. Make sure the skirt will be long enough to cover the hidden girl, and it should be a tight fit at the waist so that it won’t slip. Finished length of 10” should be plenty on a 12” T/T, and the waistband should be about 5/8” wide finished on the skirt. Gather the top of the skirt evenly to the length of the dolls’ waistline. Raw edges even, right sides together, centers matched, pin, then baste, the gathered skirt to the waistband. As a guideline, baste in a bright thread just below where you will stitch the two pieces together. Stitch, then fold the waistband up, fold over at what will be the top edge, fold the back seam allowance under and hand sew that edge along the skirt gathers. At the back ends of the waistband, trim off if necessary, and fold ½” cut ends inside the waistband tube and invisibly slip-stitch the ends together on the dolls. I recommend putting the skirt on the very last thing – after all the trim is applied, and after the arms have been attached. One girl will have the waistband, the other girl will have a sash (I like a coordinating ribbon tied in the back). 11. Attaching the arms: Fold the raw edges inside the arm, slightly gather and ease as you whip the top of the arms onto the shoulders. Make sure the thumbs point forward and the arms are the same length and loosely attached enough that they can hang down inside the skirt when that girl is hidden. The arms should be pretty lightweight so they won’t tear the shoulder fabric over time. 12. Tie the ribbon sash around the waist of the girl without the waistband. Secure with several invisible stitches or a few dots of fabric glue. This was a simple little doll with historical ancestors, quick to make and a good way to learn painting a cloth doll with oils. I have several old Topsys, but none of them as nicely-dressed as Tansy/Tabby turned out to be.